Y-Comm is a new communications architecture that will meet the challenge of providing ubiquitous heterogeneous communication on a global scale. This new Internet will provide continuous connectivity by the seamless operation of multiple mobile networks that will simultaneously be accessible by mobile nodes. It will also provide transparent support for quality of service (QoS), fostering the development of new kinds of applications. Finally, it will provide built-in multi-layer security. Y-Comm is based on the observation that the widespread deployment of mobile wireless networks represents a key evolutionary step in the development of the Internet. It splits the Internet into two distinct components: a core network comprising an optically switched backbone surrounded by fast access networks, and peripheral networks dominated by different wireless technologies. Y-Comm seeks to represent this new reality as an architecture comprising two frameworks. The first, the Peripheral Framework, runs on the mobile node and interacts with peripheral wireless networks. The second, the Core Framework, runs in a distributed fashion in the core infrastructure. The Y-Comm architecture is shown in Figure 1. Figure 1: The Y-COMM architecture. In addition to the Core and Peripheral Frameworks, Y-Comm has a multi-layer security system that works with the two frameworks to provide a completely secure environment. Y-Comm came about because of work done on the Cambridge Wireless Testbed at the University of Cambridge. Designed for studying vertical handover, this testbed was built using several networks including WLANs, GPRS and LANs. End devices consisted of desktop machines doing handovers between GPRS and local LAN as well as mobile devices doing handover between WLAN and LAN systems. The Cambridge Wireless Testbed built mechanisms to implement client-based vertical handover in which the mobile node, not the network, controlled the handover. The mobile node monitors the state of its various network interfaces and decides when and where handover should occur. In addition to client-based handover, a reactive policy mechanism called PROTON was invented to look at when handover should occur. Following this effort, the key issue was this: how would you build a commercial network to provide seamless ubiquitous connectivity? It soon became clear that a new framework was needed to build future mobile systems. Traditional frameworks such as the OSI model are inadequate to meet these challenges, and so Y-Comm was born. The Y-Comm research group comprises a number of academic institutions exploring a variety of aspects of Y-Comm design. It includes the School of Engineering and Information Sciences (EIS) at Middlesex University in London, the Computer Laboratory at the University of Cambridge, and The Institute of Science, Mathematics and Computing at the University of Sao Paulo in Brazil. Other institutions include Loughborough University, the University of Calgary, Dartmouth University USA and the University of Trinidad and Tobago. One of the great outcomes of studying the Y-Comm architecture is that it has helped us to clearly define the new technologies that are needed to support future heterogeneous mobile networks. For the Peripheral Framework, this includes cognitive radio, vertical handover and policy management mechanisms as well as QoS-aware middleware systems and the ability to build new application environments using these underlying technologies. 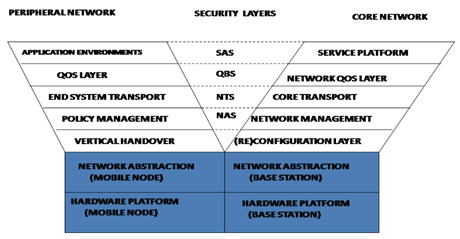 For the Core Framework we need programmable techniques to manage key parts of the mobile infrastructure, network virtualization techniques to manage networks in different geographical areas, core-endpoint management, and service platforms for the widespread deployment of network services and applications. A new research network is being formed to develop and bring together these diverse technologies. Over the next few months, we hope to begin work on a Y-Comm testbed, which will be used to test algorithms and mechanisms needed to implement the Y-Comm architecture. The testbed will initially support vertical handover between WLAN, 3G and LAN systems and will first concentrate on demonstrating a complete implementation of the Peripheral Framework running on a mobile node using the Android Operating System.